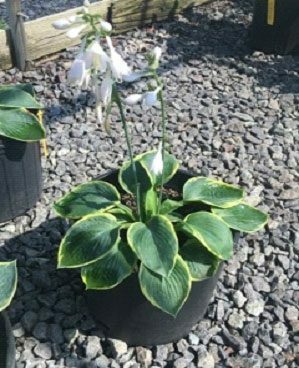 The Frances Williams hosta is one of the most popular varieties in the United States. Let’s take a look at why this plant has found its way into so many gardens and landscapes. For starters, the Frances Williams has a unique appearance. The blue-green leaves are surrounded by a wide yellow edge. Their corrugated texture makes them really stand out from other varieties of hostas, as well as other plants in general. White flowers appear in the middle of the summer to add even more visual interest. The Frances Williams hosta is also very easy to grow. It’s especially heat resistant, making it a great choice for our hot South Carolina summers. It’s also resistant to slugs. Plant it in partial to full shade and water regularly. After they’re established, these plants will become more tolerant of dry conditions. Expect the Frances Williams variety to reach about two feet high and two to three feet wide.